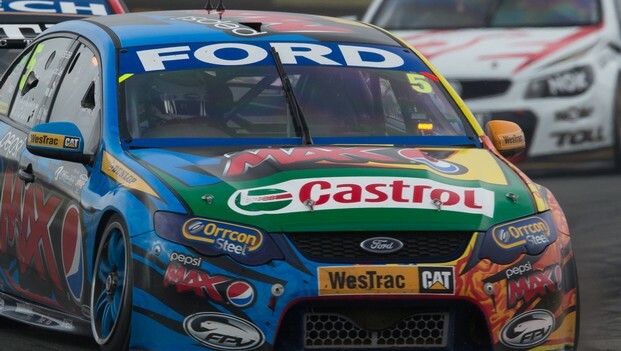 Mark Winterbottom is being stalked by Holden's Kiwi contingent as he aims to notch a rare V8 Supercars race win for Ford in Auckland this weekend. Winterbottom set the fastest time in practice on Friday for round three of the championship, which has returned to the Pukekohe track on the southern outskirts of the city after five years on a street circuit in Hamilton. 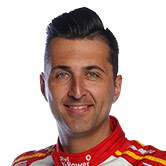 The 31-year-old's best lap of one minute 2.6918 seconds in his Falcon FG was just 0.015sec quicker than championship leader Jamie Whincup while fellow Holden driver Fabian Coulthard was third fastest. In 21 races at Pukekohe from 2001-07, Marcos Ambrose in 2004 has been the only Ford driver to take the chequered flag. But as well as fighting Ford's dismal record at the quirky 2.9km circuit, Winterbottom will also have to contend with a trio of pacy and in-form New Zealanders who will be buoyed by local fans. And add to that the emotion of competing for the inaugural Jason Richards Memorial Trophy, named in honour of the popular Kiwi V8 driver who died of a rare form of cancer in 2011. Although there are only four Kiwi drivers among the 27-man field, three of them finished in the top six on the practice timesheets. Coulthard, who won two of the three races in Tasmania last weekend, was followed by compatriots Shane van Gisbergen (fifth) and Scott McLaughlin (sixth) while Jonny Reid was the slowest in the field. Winterbottom felt comfortable to be back at Pukekohe after $NZ6.6 million ($A5.45 million) was spent upgrading the track to include two new corners at the end of the back straight. 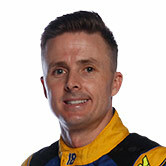 "I've always enjoyed it here; I'm happy we're back," he said after the last of four practice sessions. "I actually enjoy this place more than Hamilton. "But it looks on paper easier than what it is out there. "The back straight's still long enough to get a breather. But with the new and old surfaces, the car is tracking all over the place, even in a straight line. "It's a very unique track and it's always a good fun place." Whincup, who leads the series despite having not won a race over the first two rounds this season, is also a fan of the track enhancements. 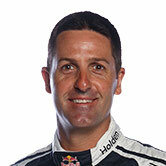 "This joint has massive character," said Whincup. "Safety is massively improved which is what we needed. "And now we've got a massive grippy section at turns five and six - brand new - it's got twice the grip as the rest of the track." England-born but Auckland-raised Coulthard admitted victory over the weekend would have special significance given his friendship with the late Richards, who he teamed with to make his Bathurst 1000 debut in 2004. "Obviously Jason played an instrumental part at Brad Jones Racing so it would be nice ... and if it isn't me, if Brighty (teammate Jason Bright) could bring it back to Albury, it would be pretty awesome," said Coulthard. Qualifying is scheduled for Saturday morning before the first of two 100km afternoon races and there will be another two races over the same distance on Sunday.